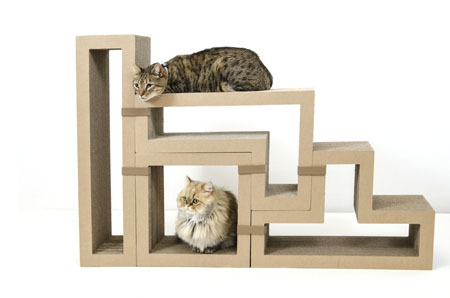 Catladyland: Cats are Funny: Katris Modular Scratching System: It's a Kickstarter Giveaway! Katris Modular Scratching System: It's a Kickstarter Giveaway! When my kids were young, they loved Lego building blocks. They'd sit for hours constructing shapes, buildings and contraptions with the various shaped and colored components. The cool thing about Legos is that just about anything is possible -- the builder's imagination is the limit. I've always loved the magic of creation, and am a fan of function. If something looks fun, but is also practical, it's a winner in my book. When Katris approached me with details about their modular scratching system for cats, needless to say, I thought the concept was top notch ... and fun! Katris has been around for a little while, and offers five shapes of blocks that can fit together, well, kind of like Legos! Not that I'm doubting your ability to visualize, but here's what I mean -- Katris offers the following shapes, as pictured in the below image: L, I, O, T and Z. Can you see the shapes in the blocks? You could even line up the blocks and spell fun words like ZIOTL, TOZIL AND ILTOZ. Teach your cats to read! Haha. But for real -- these blocks rock, right? I knew you'd agree. Well, there's more. That's right, friends -- Katris has kicked it up a notch by adding fashionable covers that easily adhere to the blocks. 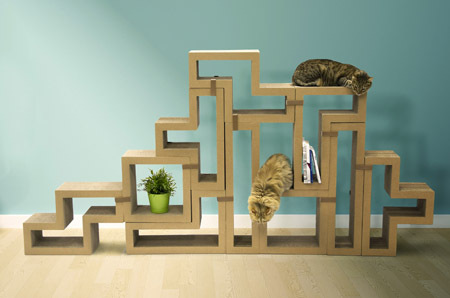 And you thought the plain blocks were mind-blowing enough. Prepare yourselves for THREE styles of Katris block covers that will rock your form-meets-function world. City Collection: A playful and colorful collection printed with non-toxic soybean ink, and gives a nod to Katris HQ in San Francisco. Made of 100% recyclable paper! Mono Collection: A simple, clean and modern collection in classic black and white. Also made of 100% Recyclable paper! Wood Collection: Traditional wood tones (maple and teak) made of high-quality veneer real wood. And the covers are simple to place on the blocks. As if the Lego comparison didn't already make you feel like a kid again ... stickers! Watch this. Katris is starting a Kickstarter campaign on August 17 to create these fashionable and fun covers, and they're giving Catladyland readers the opportunity to win two blocks and covers of their choice (approximate value is $188)! Isn't that the best? One winner will be randomly chosen. U.S. and Canadian residents only. Worldwide readers are encouraged to enter and, should they win, donate the prize to a U.S. or Canadian friend or animal shelter. In the widget below, leave your name and email address. Comment on this post with your two favorite block shapes and covers. Giveaway begins today, and ends at midnight Central on Sunday, August 9. Winner will be notified by email and will have 48 hours from the email date and time to reply or another winner will be chosen. You will be contacted by Katris with updates on the Kickstarter goal progress. 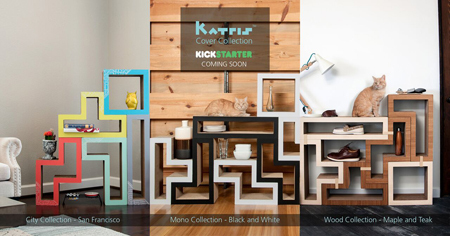 If Katris doesn't meet its Kickstarter goal, winner will receive the blocks without the covers. Here's the part where you enter -- good luck! This post is sponsored by Katris. Catladyland only shares information and products we feel are relevant to our readers. Katris is not responsible for the content of this post.